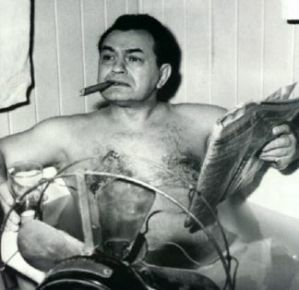 Edward G. Robinson smoking a Soylent Green-based cigar. Tastes a lot like chicken. And so cannot say that I saw Soylent Green in a theater, but I count this as better because we watched it on a larger-than-usual-screen intended for larger-than-usual audiences not gathered in an auditorium. This was no video, either. This was film, an actual movie print. I’m just not sure if the projector was the standard 16mm carted from room to room as needed, or if it was a 35mm with a bit more umph for the larger-than-usual-screen. I’ve every confidence the film was shown in full compliance with whatever all professional organizations involved and that all fees, contracts and royalties were checked, agreed upon and honored along the way. I still don’t know what was the occasion that brought about the showing of the Soylent Green. I could have been Earth Day seeing as how the Dallas County Community College District was ever about an aggressive approach to things progressive, pro-active if not PC, and Earth Day only having turned three or four during that year would have been all the above. The program was that we were to watch the movie, and then a special guest would make himself available afterwards for answering questions we might have. We might have had some. We might have had more if we cared at the time. The special guest was Harry Harrison, the author of “Make Room!” the book on which the Soylent Green was derived. Harry Harrison was a pretty cool guy. ((I must point out here that he was then pretty much the same age as I am today.)) And he was out there in his fashion sense, fully in step with projecting a sci-fi author persona: dark slacks, black boots, black leather jacket, sun glasses, shaved head. He looked like a freak back then what with all us guys still in the residual Woodstock fashion currents. Harry Harrison had been busy enough as a writer until then, by all accounts, and was riding some kind of a wave on a lecture circuit spawned from the wake of the movie based upon his book. His body of work as grown steadily since that time and only occasionally or modestly points toward the film in passing reference. Mr. Harrison was clear about his views, his passion, that the world was in danger of overpopulation, that humans were going to destroy themselves one way or another. His emphasis was on starvation, the fact that we were–and this is almost 40 years ago–nearly out of “arable land.” I remember him repeating that phrase “out of arable land” with growing emphasis and passion with every instance and example he mentioned. Okay. Mission accomplished. Thoughtful thoughts and been thunk and expressed at about the highest level one could expect at a community college. We, the students, had been exposed to thought-provoking provocations. We had met and interacted with a real, live sci-fi writer. We felt good about ourselves, the institution, the system, oh, just everything. And Harry Harrison got a nice honorarium for his efforts, to be sure. But I wasn’t sold. I wasn’t buying anything he had to say. I still don’t. Oh, I thought story made a good one as far as sci-fi goes. But the over-crowded planet problem is not of numbers but of management, resources, politics. So, forget that. We have all the tools and technology and know-how at our command enough to provide excess for all. The problem is in mastering our hearts, our appetites, our desire for power and control at the expense of millions of lives. That is the horror of life. Nothing was asked of us in any of our classes regarding the event of Soylent Green, its viewing, the lecture, the discussion. Not tie-ins to curriculum or anything. Missed opportunity there, teachers, I think. But that was then. And I’m saying this years later when most of you are dead or nearly so, contrary to how ancient you seemed to my eyes when we knew each other as classroom entities. I remember the conflict of satisfaction and disappointment when Harry Harrison assured us, as if to set the record straight, that the concept of Soylent Green, humans as a food source for humans, cannibalism… he assured us that was not his idea but that of the Hollywood suits, the producers, the screenwriters… they gotta make sick, sensational enough to where people will watch it, investors will invest in it, actors will act in it. ((except for Heston… you call that acting? Moses! Moses! Moses! surely most of that cast had to have been in that other movie with him…)) Sadly, very sadly, probably the most notable asterisk attributed to Soylent Green is that of Edward G. Robinson’s final film. I actually believed his performance, his and Joseph Cotten’s. And I actually hated Chuck Connor’s bad-guy character in the way that I was probably supposed to hate him, which is good. I won’t go into all the sexist stuff that I actually found disturbing… the women as furniture, stereotypical roles cast. No flat screen TVs in that future. Not a bad thing, really. But lots of people were sleeping where they should not have been sleeping, whether in somebody’s bed or on the street or in a stairwell. Some things never change.